The vehicles maintain the same horsepower, torque, and towing capacity as their Ford gasoline-fueled counterparts, and are powered by a Ford 6.8-liter V-10 two-valve engine. They are compliant with heavy-duty onboard diagnostics. The vehicle will emit about 90,000 fewer pounds of carbon dioxide over its lifetime compared to a gasoline-fueled counterpart. Historically, propane autogas costs up to 40% less than gasoline and 50% less than diesel, and reduces maintenance costs due to its cleaner-burning properties. ROUSH CleanTech launched the new propane autogas model at the American Public Transportation Association (APTA) Expo in Atlanta. 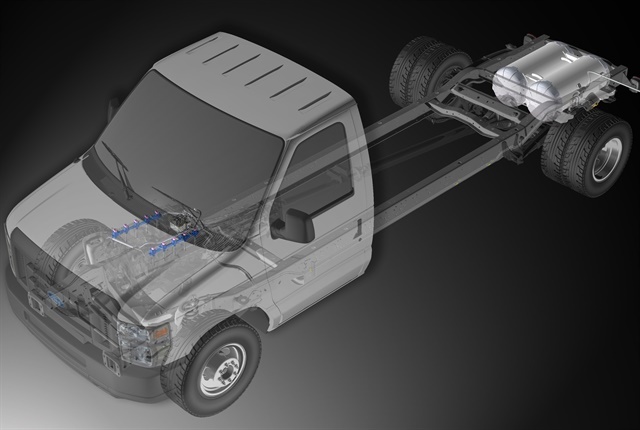 The propane autogas Ford E-350 cutaway will be available for the 2018 model year. Orders are now being taken with deliveries beginning by late spring 2018. They are expected to receive certification from the U.S. Environmental Protection Agency and California Air Resources Board.